Dr. Wadhawan activating coffee e-marketplace in New Delhi. 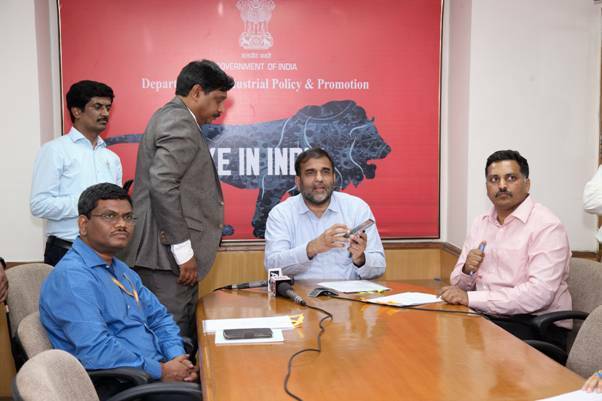 Commerce Secretary, Dr. Anup Wadhawan, launched the pilot project via video conference on 28 Mar 2018 from New Delhi. The project was activated simultaneously by Jose Dauster Sette, Executive Director, International Coffee Organisation’s (ICO) from Nairobi. The blockchain will also reduce the number of layers between coffee growers and buyers and help farmers double their income, said Wadhawan. India is the only country in the world where entire coffee is grown under shade, handpicked and sun dried. It produces one of the best coffees in the world, produced by small coffee growers, tribal farmers adjacent to National Parks and Wild Life Sanctuaries in the Western and Eastern Ghats, which are two of the major bio-diversity hot spots in the world. Indian coffee is highly valued in the world market and sold at a premium. But the share of farmers in the final returns from coffee is very meagre. This initiative will help in creating a brand image for Indian Coffee through traceability in reducing growers’ dependency an intermediaries by having a direct access to buyers for a fair price for their produce. The initiative would help find the right coffee suppliers for exporters and within the stipulated time to meet the growing demands. It would also build a better trust and long-term relationship due to increased visibility towards the traceability and transparency of the produce. The Coffee Board is collaborating with Eka Plus, one of the global leaders in Digital Commodity Management platforms for Agriculture for development of Blockchain based marketplace application. Eka Plus have developed the application with a group of 5-20 coffee farmers, exporters, roasters, importers and retailers registered on the platform from India and abroad. It is one of the few coffee blockchain processor for coffee after France and Ethiopia in the world. The stakeholder like coffee farmers, traders, coffee curers, exporters, rosters, importers and retailers are trading on the platform. The coffee farmer registers credentials like place where coffee is grown, details of the crop, elevation, certificates if any and any relevant information. A block is created for each of the lot the farmer sells on the Blockchain.